The Vena8 Fluoro+™ biochip is ideal for rolling and adhesion assays on protein coatings or cell monolayers. 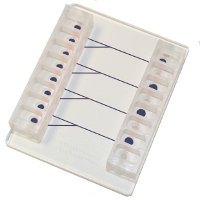 Ideal for thrombosis; whole blood assays. 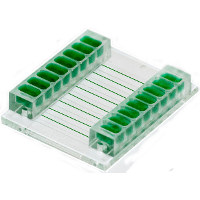 Compatible with immunofluorescence and confocal microscopy. 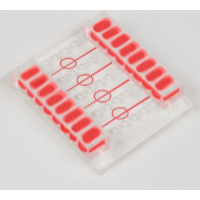 The Vena8 Endothelial+™ biochip is ideal for cell-cell rolling and adhesion assays on cell monolayers and cell culture under shear flow. Ideal for use with PCR. Compatible with brightfield, phase contrast imaging and fluorescence microscopy. 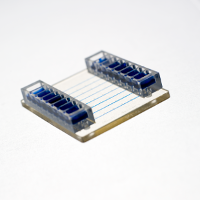 The VenaT4™ biochip for chemotaxis, transmigration and invasion assays. Compatible with brightfield, phase contrast imaging and fluorescence microscopy. 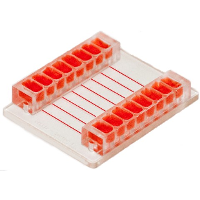 The Vena8™ biochip with/without glass coverslip adhered; with/without treatment for cell rolling and adhesion on proteins; seeding of cells or microbes and subsequent study of drug interaction, imaging or molecular biology studies under shear flow. Compatible with brightfield, phase contrast imaging, immunofluorescence and confocal microscopy. VenaDeltaY2 BiochipThe VenaDeltaY1™ and VenaDeltaY2™ biochips contain branching microchannels for dual flow / dual injection of samples. Ideal for studying chemotactic gradients, dual flow, multilaminar flow & diffusion.